For over 100 years, Crowe has been making smart decisions for multinational clients working across borders. Ranked the eighth largest accounting network in the world and the sixth largest accounting network in Asia, Crowe has over 200 independent accounting and advisory firms in 130 countries. It is also one of only seven global firms in Gartner’s “magic quadrant” for risk consulting services. The network has a total global workforce of 36,540 professionals and global revenues of US$4.3 billion. 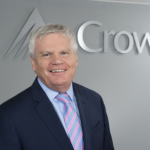 Crowe Global (Crowe) announced on 1st February its latest financial performance information, showing revenues of $4.3 billion (revenue growth of 14%) in 2018. This leap comes off the back of a standout year for the world’s eighth largest accounting network, which underwent a major strategic brand consolidation exercise during the period. The results show strong performance across the board, bolstered by impressive performances in the US, Germany, UK and Singapore and targeted acquisition activity from key member firms. The numbers cap a great year for new Chief Executive David Mellor, who stepped up from UK CEO to Global CEO in April 2018. Geographically, each of Crowe’s regional groups experienced growth, with the Asia Pacific practice growing by 41%, Africa by 9%, Middle East by 7%, North America by 6%, Europe by 5% and Latin America by 2%. Crowe won exclusive membership of Ruihua CPAs in China – the nation’s second largest accounting practice behind only PwC – driving growth in a core market while, elsewhere in Asia, the acquisition of Tokyo in Japan (from BDO) boosted revenues by $40 million. Standout results came from some of the network’s most well-established members, including: the US (9% growth), Germany (17%), the UK (18%) and Crowe BGK Canada (33%). At the same time, smaller member firms also achieved remarkable results, including Hungary (104% growth).